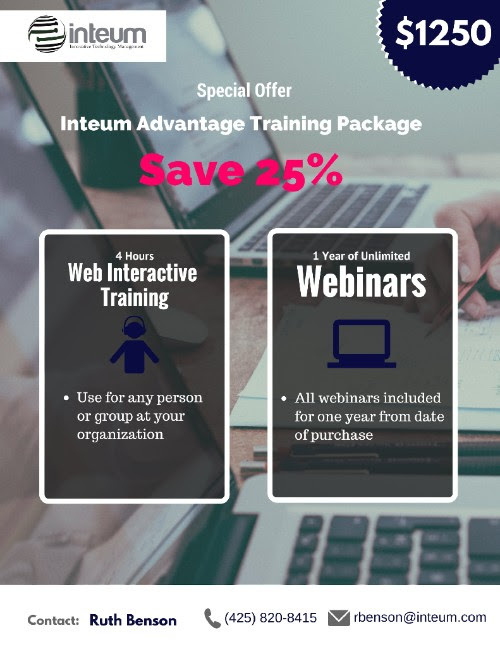 We are offering the Inteum Advantage Training Package for only $1250. That is 25% off the regular price. The package includes four hours of our Web Interactive Training (WIT) where you, your colleagues or anyone at your organization receives personalized training from your account manager. WIT is a great way to bring you and your team up to speed on any module or process in Inteum. Also, if you sign up for our Advantage Package, your organization will receive unlimited webinars for one year. If you have questions, please contact Ruth Benson, rbenson@inteum.com or your account manager.